Don’t you just love when you write or discuss something you feel is important, and then industry changes happen that prove your point even more? Just this week my article, How to Ensure Search Engines and Consumers Trust a Local Business Website, was featured on Search Engine People. And this week in Google News, they updated their Search Quality Evaluator Guidelines. 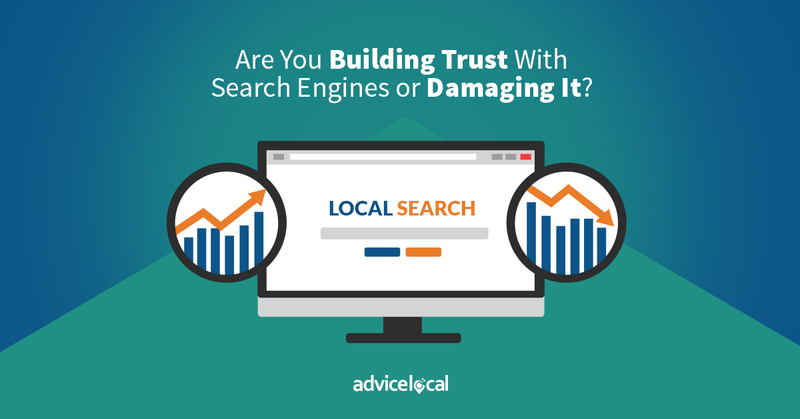 Are You Building Trust With Search Engines or Damaging It? The theme of my article is trust. You get that from the title right away. Expertise, authoritativeness and trustworthiness (E-A-T) are at the very core of a local business’ and brand’s online presence. While these are Google’s specifics for what quality content should be comprised of, they also translate to how we make decisions about those we buy from, where we eat, and the establishments we frequent. Can you have trust without expertise and authority? I think not. Specifically, one of the revisions they made this week defines the parameters for when to rate a page as low. To put it simply, it’s when the page fails to demonstrate trust. In the new world according to Google, even when a page shows itself to have a beneficial purpose, but doesn’t demonstrate E-A-T, it should be rated as low. If the page demonstrates E-A-T, but the main content (MC) quality is lacking, or it doesn’t have enough on the page, then it also should be marked as low. While everyone loves a good click-bait headline, they’re a thing of the past – and Google agrees. If the MC quality is good but the titles are exaggerated, the page should be rated as low. Search Engine Journal’s Matt Southern goes into detail in this article about the other changes that were made. For local businesses and brands to place in the top of search results, search engines and consumers have to trust them. Doing things like publishing poor quality content, building links on low quality sources, lacking or having poor reviews, and having inconsistent data will all impact trust. So are you building trust? Start with running our free online visibility report to see how the businesses you represent stack up against the competition. Just wanted to let you know that I enjoy the Advice Local tool. It’s a great addition to our “arsenal” . . . it’s a lot easier to sell than the other packages we have. It’s exactly what an agency would want – makes it simple.